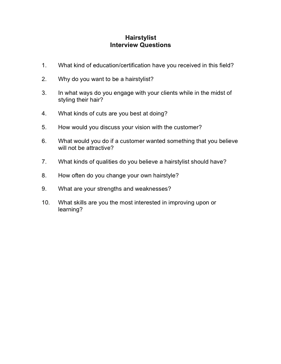 Choose your next Hairstylist with the aid of these helpful interview questions. 1. What kind of education/certification have you received in this field? 2. Why do you want to be a hairstylist? 3. In what ways do you engage with your clients while in the midst of styling their hair? 4. What kinds of cuts are you best at doing? 7. What kinds of qualities do you believe a hairstylist should have? 8. How often do you change your own hairstyle?